Guess what, guys. I finally ran outside today! Mom drove up and clocked five miles with me. She and I are both training for the Chicago Women's Half Marathon, so I'm sure this was the first of many long runs that we'll doing together. The weather? Chilly, but manageable. I didn't realize how cold it was until I finished running. But, I'd rather be cold when I'm running than sweltering hot. That's not fun to me. At all. With a number of my instructors out this past week on various Spring Break trips, I found myself subbing a few classes. One of which was a Spinning class on Thursday. We did an endurance-based ride, which left me wiped so I didn't give that 3.5 miles a second thought. 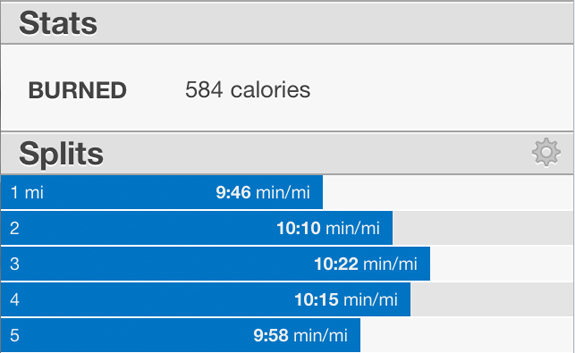 Obviously it didn't hurt me too much as today's run went really well. So far, nothing crazy on the books for this week so I should be able to clock all of my scheduled runs. Hello, yellow! I still can't believe I won a pair of Reebok Sublite training shoes from Blonde Ponytail. You guys should really be reading her blog. She posts some awesome workouts, and she's a superfit preggo right now—that still does some awesome workouts of her own. You all know how much I loved working out when I was pregnant. Go check her out! I am all about fitness clothing that doesn't break my bank since I'm in the stuff every day, sometimes twice per day. The perk of working at a gym is that you get to dress the part...comfy, but still quite expensive. Unless you find the deals. Back tomorrow with another giveaway. Question: Garmin or Polar? Why?